Build community among students, forming lasting bonds with each other and with their teachers that will support them and allow them to make the most out of their educational experiences at Park City Day School. Being in the outdoors, out of their regular settings and routines, provides students and teachers a unique space (physical as well as mental space) for building these bonds. Community building at PCDS through OL will center around our “Strive for Five” school values of Integrity, Responsibility, Respect, Teamwork and Compassion - through which students and teachers establish a foundation of trust necessary for successful relationships and a healthy school culture. Nurture an appreciation for and responsible practice for being in the outdoors, for enjoyment of the stunning natural playgrounds available to us in Utah and a sense of stewardship for the natural surroundings that provide us spaces to live. Stewardship of our natural places includes developing sustainable and respectful outdoor etiquette (leave no trace practices, for example), as well as providing opportunity for student thoughtful reflection about the places they inhabit, enjoy and depend upon. Integration of and reflection on “Strive for Five” values as part of the trip activities. Deliberate and thoughtful attention is given in the context of the outdoor experience to incorporating activities (energizers, team-building challenges, group problem-solving activities, etc.) that ask students to consider how they live our school values on a daily basis in different situations...and to practice living those values in a mindful and meaningful way. Reflection opportunities might included journaling, group discussion, or built into the “knowledge sharing” piece that would be part of the plan for many of the outings. How does this experience/activity connect in substantive, meaningful ways with subject area curriculum at that grade level? In the context of place-based learning, we will endeavor to make use of the resources available in the locations to which we venture on these outings to provide opportunity for real-world application of skills/knowledge and hands-on research/inquiry in the field. 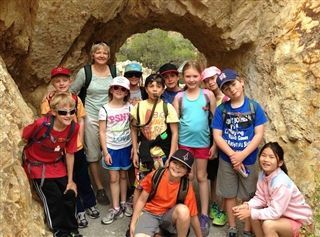 Always with a focus on authentic learning, students would be asked to bring back from their outings something to share with the larger community at PCDS - as appropriate for their grade and skill level. Possibilities include videos; slideshows; research papers, presentations to small groups/school assembly, articles in the newspaper, educational evenings at school, artwork, etc. Incorporating progressively more sophisticated concepts and more challenging physical activities, OL experiences introduce students to the sheer fun of being and doing outdoors and developing responsible practices for being outdoors. Over the course of several years in the program students would be introduced to a variety of recreational activities including hiking, camping, snowshoeing, cross-country skiing, canyoneering, rock climbing, canoeing/kayaking, mountain biking, etc. In the context of participating in these activities, students would gain an understanding of basic outdoor skills and etiquette: things like preparedness, trail etiquette, plant and animal identification, land use issues, camping etiquette, etc. To frame our efforts in OL, an overall place-based approach to learning utilizes the “places” that surround our students and our school (from our immediate physical surroundings to our local and regional communities) as learning resources, turning the larger community into an extension of our classrooms. By immersing the students in the local heritage, culture, ecology, landscape, and recreational opportunities and experiences, teachers provide opportunity for “real world” applications of the skills and knowledge students are studying in across the curriculum: math, science, art, English, history and Spanish, bringing this knowledge to life for students. Furthermore, connecting students (and curriculum) to place creates vibrant partnerships between our school and the community. The connection between student,classroom, school, and community encourages in our students a sense of stewardship of the world around them through a deeper understanding of place, through active engagement with local community organizations and, hopefully inspire in them the desire to take action in their own communities now and in the future.